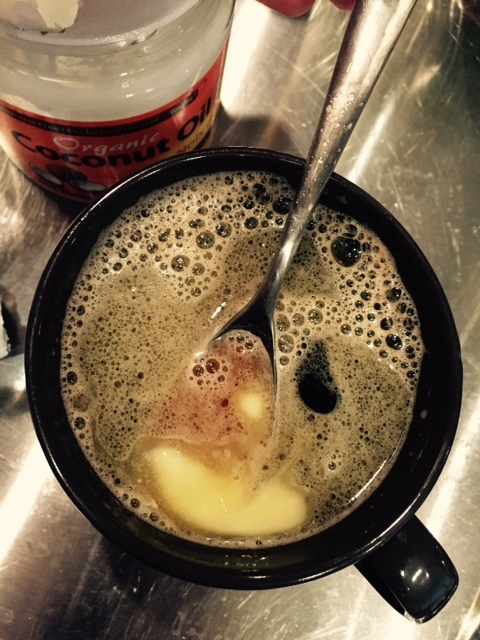 Imagine waking up in the morning to a breakfast of butter, oil, and coffee. Better known as Bulletproof Coffee, it’s the new rage in the diet world. With proponents noting marked improvements in alertness, hunger suppression, and weight loss, bulletproof coffee and its creator are altering the morning routine. But navigating through these claims, the science doesn’t align. After a trip to Tibet in 2004, Silicon Valley businessman Dave Asprey tasted Tibetan Yak Butter Tea: a concoction of brewed tea, salt, and yak butter. Upon returning to the U.S., Asprey devised his own version. Now marketed as bulletproof coffee (or BPC), it pairs well with his newly released book The Bulletproof Diet. Advocates for BPC include U.S. Olympic marathoner Ryan Hall, Divergent actor Shailene Woodley, and singer/songwriter Ed Sheeran. BPC is said to be creamier than a latte, prevent hunger before lunch, increase alertness, and be loaded with vitamins A, E, and K2 alongside omega-3 fatty acids. Yet the most enticing reason in opting for this drink is because it seemingly causes weight loss without having to exercise. 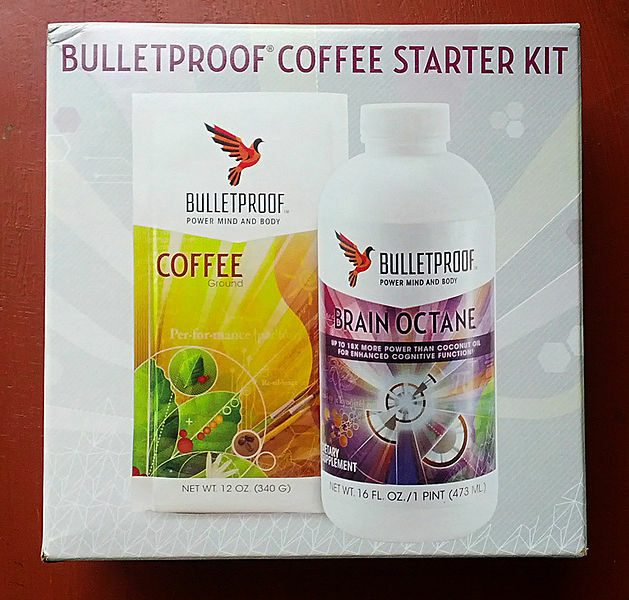 Bulletproof® Upgraded™ brewed coffee beans. Keep in mind, BPC is meant as a breakfast replacement. So let’s compare the BPC nutritional content to that of a typical breakfast: two scrambled eggs, an apple, black coffee, and a slice of whole grain toast with a tablespoon of peanut butter. Typical Breakfast BPC *Unable to find specific nutrient data for grass-fed butter and omega-3 content. **The USDA Foods List only lists information for vitamin K1. Starting the day off with a high-fat brew that shuns hunger and enhances alertness sounds like a great idea. Losing weight is easier when your stomach isn’t grumbling. High-fat BPC in the gut slows the rate of stomach emptying, suppresses ghrelin (the “eat more” hormone), and reduces the amount of calories consumed at subsequent snacks and meals. Since fat takes the longest to leave the stomach and be digested, even in its liquid form, Asprey’s claim makes some sense. But Asprey’s claims regarding omega-3s and vitamins A, E, and K2 are cloudier. The amount of these nutrients in grass-fed versus conventionally grain-fed beef is higher. Yet only 60% of studies found a statistically significant difference. Further, no research exists on the amount of omega-3 fatty acids in butter- all the research comparing omega-3 contents is in types of beef, not dairy. Recently, I contacted Kerrygold, a popular brand of grass-fed butter, and asked them to elaborate on the omega-3 content their product. They responded by saying that they have no research on omega-3’s present in butter. While grass-fed dairy may be a wiser nutritional source, there is currently no research that supports Asprey’s supposition that it has more omega-3s. The caffeine content of BPC is likely the source of increased alertness drinkers report. It’s also possible that if the coffee truly does have a higher omega-3 content, those omega-3s could give the brain extra power. Asprey’s line of Bulletproof® Upgraded™ coffee beans are touted as being free of mycotoxins (i.e., mold), which he claims are pervasive components of every other coffee on the market. However, coffee producers like Starbucks and Dunkin Donuts have long known about these mycotoxins. That’s why coffee beans are wet-processed, which means that the beans are washed to eliminate the mold. So the upgraded brew is no better than the rest. But what really stands out about BPC? How about its fat content: the brew fulfills 23% of both your daily total caloric and fat intake. The Institute of Medicine (IOM) recommends 25-35% of daily total calories should come from fat. BPC fulfills that quota on its own. The Canadian Society of Intestinal Research also reminds us how fat is a stimulant for the intestines. Higher intakes may result in abdominal cramping, diarrhea, and floating stools. But that’s never advertised. Being so high in calories, how can BPC help weight loss? If, like with any diet, fewer calories are consumed, then weight loss may occur. Asprey’s book recommends following a low-carbohydrate diet as to induce ketosis. And food restriction generally leads to weight loss. In an interview with Runner’s World, University of California Davis’ director of sports nutrition Liz Applegate debunks Asprey’s idea behind Brain Octane™ oil, which is made of medium-chain triglycerides (MCTs). Asprey believes that the oil increases the body’s ability to burn calories because it is processed differently than other fats. Unlike long-chain triglycerides, MCTs pass directly from the gut into the bloodstream and are immediately available to be burned for energy. However, Applegate notes that there is no scientific evidence to support MCTs’ ability to increase metabolism and promote weight loss. If consumed in amounts that surpass the body’s immediate needs, MCTs will still be converted to and stored as fat. Ultimately, this article wouldn’t be complete without attempting BPC myself. I found it odd watching butter dissolve into my morning cup. The oil slick on top was definitely unsettling. Using coconut oil and regular coffee in place of Asprey’s oil and beans, the concoction was creamy with a subtle hint of coconut. My hunger was suppressed the rest of the day, cravings for carbs were reduced, and I was able to forgo my mid-morning snack. In comparison to my normal routine of breakfast and a snack, I likely saved 120 calories. But due to an injury, I was unable to exercise. Would this daily pattern of high-fat BPC power me through morning exercise sessions? Should YOU add BPC to your diet? The typical breakfast provides protein and fiber, long having been touted as essentials for their hunger-suppressing properties. But choose BPC, and neither exist. The idea is you can’t have both food and BPC. For those who already eat breakfast, replacing it with BPC on a short-term basis or intermittently could be all right. The BPC’s calories are appropriate for a morning meal. Caloric intake may even be less, depending on what one would normally eat. However, the habit of drinking coffee alongside breakfast may return, thereby increasing total calories consumed. In a recent article, Chris Gayomali, a journalist for Fast Company, tried BPC for two weeks. By the end, he was adding toast in addition to his BPC. After two weeks he ditched BPC completely because he missed eating solids. Diet trends tend to fail due to deprivation. Given that all other meals and snacks consumed throughout the day remain constant, having BPC and food in the morning could lead to weight gain since it is so high in calories. If you’re adamant about BPC, doing so every-other-day and ensuring intake of higher fiber and protein foods is advised. That way you can indulge while still limiting saturated fat intakes, promoting gut health with fiber, and sparing protein. Following the IOM guidelines, you wouldn’t require any additional fat on a BPC day. On those days opt for vegetable-dishes, lean protein, and unsaturated fats, like those from nuts, plant oils, and avocados. For those who don’t typically eat breakfast, adding almost 500 calories of BPC in addition to your usual food consumption could lead to significant weight gain. So what’s the final consensus? When it comes to Bulletproof Coffee, the science is lacking. Egregious claims that the oil supplies “fast energy for the brain,” “reduces brain fog,” and is responsible for “rebalancing…yeast in the gut” are stated on Asprey’s website. Yet they lack any footnotes for supporting literature. We also can’t look at foods in isolation. Rather, the whole diet matters. Asprey’s BPC argument focuses on the nutrients in two items: butter and oil. Humans are encouraged to seek variety in the foods we eat. The typical breakfast I detailed above already contains all of the nutrients advertised as part of BPC and more. If for an entire month one were to replace their breakfast with solely BPC they would be missing out on vital nutrients that variety would fulfill. Like any other diet, BPC is supposedly “universal.” It’s meant to meet the needs of all of its followers. For me, I felt full. Others may be starving after just a couple hours. And ultimately, Dave Asprey is a businessman. His empire includes a line of pricey oil and coffee beans in addition to travel mugs, T-shirts, and anti-aging skin creams. With a booming business plan, book, and BPC shops in the works, Asprey is raking it in when you drink his breakfast of champions. Ally Gallop, BSc, RD is a Certified Diabetes Educator and is studying towards an MS/MPH focusing in health communication and epidemiology. She continues to drink black coffee alongside her high-fiber and scrambled egg breakfast. Thank you for the breakdown of BPC. I have always been skeptical of the founder’s claims, particularly as they are littered with unverifiable metaphors… it is nice to have a clear, concise, and transparent summary of the scientific facts.